Polly – Available for Adoption! My name is Polly the Pug (but you can call me Polly). I am 5 years old and ready to live the pug life. Right now, I’m living with my foster mom and dad, a human foster brother and 2 foster pug sisters. 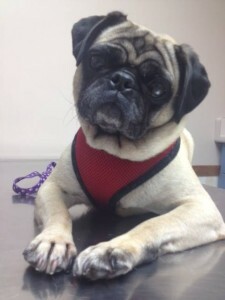 My foster pug sisters have taught me a lot of great and wonderful things like how to earn bites of hot dog and other yummy treats! Foster mom says I have to sleep in my crate at night because I have not learned how to go down stairs yet and she doesn’t want me to get hurt if I get up at night. I don’t mind sleeping in my crate, but I’d rather sleep in bed with my foster brother or my foster mom and dad. After foster mom goes to work, foster dad let me sleep in bed, which I really like…but ssshhh…it’s our secret!!! I get along with kids and other dogs. But can be a little leery of women. I’m still new to this whole leash and harness bit, so please be patient with me as I learn. I can be quite the harness escape artist, so foster mom says my harness has to be a little on the snug-pug side. Being a pampered pug is hard work. So I like to take several naps during the day. I also like playing with my toys and relaxing on the couch watching TV or movies. And let’s not forget the BEST part of the day…DINNER TIME!!!!!! I like running around in the backyard and smelling the wonderful backyard smells. I really enjoy being near my humans so if you don’t mind a little shadow, I’m the pug for you. Click here for more information on the adoption process!